Designed by the local ESCHWEILER AND ESCHWEILER architectural firm, the Wisconsin Gas Building (also known as the Milwaukee Gas Light Building) opened in 1930. Located at 626 E. Wisconsin Ave., the Art Deco building originally served as headquarters for the Milwaukee Gas Light Company. It continued to do so through several rounds of corporate restructuring until the company merged with Wisconsin Electric, formally establishing WE ENERGIES in 2002. At this time, the building ceased serving as company headquarters and was leased for commercial office space. The United States government became a major tenant, renting many of the floors for various federal departments. Rising 20-stories, to a height of 250 feet, the building is a staple of Milwaukee’s skyline. Utilizing an average of 1,000 builders a day, it took only a year to complete. 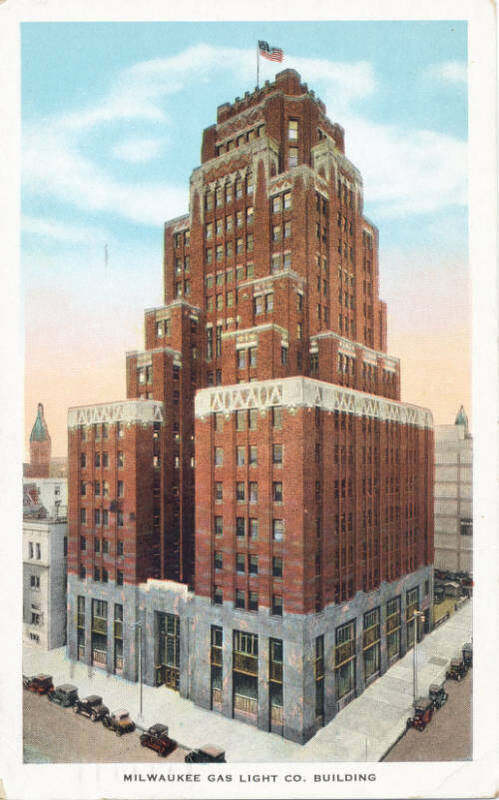 The building’s design is distinguished by its prominent bronze sunburst motif, the graduated setbacks of the upper floors, and the fade in brick color towards the top, which lends the impression of a much larger structure. The basement levels extend outward a further 25 feet, heating sidewalks for pedestrians above—a welcome feature in the winter months. In the 1950s, the entire building underwent a significant 5-year renovation project. During this time, the lobby sacrificed some of its space, and some of its aesthetic punch, to the data processing department. The company’s first IBM 650 Computer was installed in this space to process their 270,000 customer accounts. The lobby’s original twin staircases were also hidden behind walls, though the extensive use of green marble and bronze metalwork inside remains an impressive tribute to the original Art Deco design. During this renovation period, the building gained its most iconic feature—the 21-foot GAS COMPANY FLAME on top. The flame served as a weather forecast to city residents and a navigational light to vessels on Lake Michigan. Paul Weise purchased the building from Wisconsin Energy Corp. in 2002 and immediately began a restoration project with Eppstein Uhen Architects. Weise was careful to update the building’s accommodations without sacrificing the original Art Deco vision, as evidenced by the preservation of some of the company’s original offices and boardrooms. Indeed, he took many steps to undo some previous remodeling that camouflaged the original style. This effort is even noticeable to passing pedestrians, who may see a reproduction of the original bronze sunburst above the entryway, the original of which was removed in the 1960s. There is, however, one major loss that will never be regained through restorations. The Prohibition-era speakeasy previously on the site was demolished when the new building was constructed in 1930. ^ Mark A. Latus and Mary Ellen Young, “Wisconsin Gas Company,” Downtown Milwaukee: Seven Walking Tours of Historic Buildings and Places (Milwaukee, WI: Milwaukee American Revolution Bicentennial Commission, 1978), 50. ^ Wisconsin Energy Corporation, “WEC: History,” Wisconsin Energy Corporation, http://www.wisconsinenergy.com/aboutus/history.htm, accessed October 4, 2013. Information now available at WEC Energy Group, “History,” accessed July 7, 2016. ^ Whitney Gould, “Milwaukee Landmark to Be Restored,” Milwaukee Journal Sentinel, reproduced in The Chicago Tribune, last modified April 13, 2003, accessed October 10, 2013. ^ Joseph J. Korom, Milwaukee Architecture: A Guide to Notable Buildings (Madison, WI: Prairie Oak Press, 1995), 41. ^ Jim Drescher, property manager, as quoted by Bobby Tanzilo, “Urban Spelunking: (Re)visiting the Wisconsin Gas Flame,” OnMilwaukee, last modified August 6, 2013, accessed October 5, 2013. ^ Marie Rohde, “Heated Sidewalks Pick Up Steam in Wisconsin,” The Daily Reporter, February 11, 2011. ^ “Gas Co. Building Near End of 5-Year Remodel Plan,” The Milwaukee Sentinel, last modified December 24, 1959, accessed October 10, 2013. ^ Doors Open Milwaukee, “Gas Light Building,” Historic Milwaukee, Inc., http://doorsopenmilwaukee.org/buildings/gas-light-building/, accessed October 5, 2013. ^ Latus and Young, Downtown Milwaukee, 50. ^ Tom Daykin, “Towering Light: Developer Converting Gas Building to Office Power,” JSOnline, last modified April 12, 2001, http://www3.jsonline.com/bym/biz2biz/apr01/daykcol13041201a.asp?format=print, accessed October 10, 2013. Doors Open Milwaukee. “Gas Light Building.” Historic Milwaukee, Inc. http://doorsopenmilwaukee.org/buildings/gas-light-building/, accessed October 5, 2013. Gould, Whitney. “Milwaukee Landmark to be Restored.” The Journal Sentinel. Reproduced in The Chicago Tribune. Last modified April 13, 2003. Accessed October 10, 2013. Latus, Mark A., and Mary Ellen Young. “Wisconsin Gas Company.” Downtown Milwaukee: Seven Walking Tours of Historic Buildings and Places. Milwaukee, WI: Milwaukee American Revolution Bicentennial Commission, 1978. Tanzilo, Bobby. “Urban Spelunking: (Re)visiting the Wisconsin Gas Flame.” OnMilwaukee. Last modified August 6, 2013. Accessed October 5, 2013. Wisconsin Energy Group. “History.” Accessed July 7, 2016.